HealthPrint+ is YFH’s most comprehensive service. It is unique because it offers the complete blood cell analysis with the manual differential (critical knowledge for having a healthy immune system) and plasma glucose (critical for identifying diabetes at its earliest stage). No other direct to consumer company offers these tests which are contained in the HealthPrint + as well as the Basic HealthPrint. HealthPrint + provides two customized test kits in one test. One kit provides tests for the Basic HealthPrint which includes 56 measures and evaluates the health of the major organs of the body. The other kit provides the Intracellular Red Blood Cell analysis, 13 essential nutrients and 5 heavy metals. The HealthPrint+ also identifies how many nutrients are available to the cell to be utilized as well as how many nutrients were successfully absorbed inside the cell. This information is critical. People think that if they eat healthy foods and supplements they will be healthy. However, what is imperative to know is if what you ate was in fact digested, absorbed and utilized by the cells or was it blocked from being absorbed. If the cell does not absorb the nutrients needed to be healthy then disease begins. 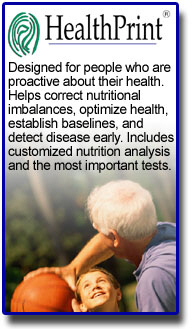 This premium service is designed for people who want complete control over their health. HealthPrint+ like the Basic HealthPrint is customized to your unique biochemistry and includes detailed nutrition analysis that specifies the foods and supplements you need to eat to achieve optimum scores. HealthPrint+ clearly identifies which tests you need to improve in order to optimize your health. You receive your test results directly from YFH. Group telephone conferences to explain your tests statistically are included for free with every test. Your doctor does not need to order the tests or release the results to you. YFH handles of all these details for you (YFH always encourages it's clients to share their official results with their Doctor). HealthPrint+ as well as the Basic HealthPrint were created based on a very simple principle that normal blood test scores are not good enough. They are not good enough because people still get sick and sometimes die with laboratory normal scores. HealthPrint+/HealthPrints go above and beyond the standard lab normal ranges that compare you to generic population averages taken from people who are already sick. In addition to normal ranges, your HealthPrint will compare your scores to YFH customized Optimum Ranges based on YFH’s 40 year database. HealthPrint+/ HealthPrints are very specific, but they are also very easy-to-understand. Now you don’t have to wait until you feel sick to make changes to your health. If you want to be the captain of your healthcare team, if you don’t like to cut corners, if you are proactive and have the self-determination to make changes to your diet and lifestyle, then order the HealthPrint + now.